With the coming of the railroad in 1886, the West Coast Land Company set aside 160 acres for the town of Templeton after purchasing 63,000 acres of surrounding countryside for subdividing into small ranches to sell to settlers. Originally the town was called Crocker after Charles F. Crocker, a vice president of the Southern Pacific Railroad. Crocker declined the honor of having a town named after him and chose Templeton, the name of his 2-year-old son, instead. 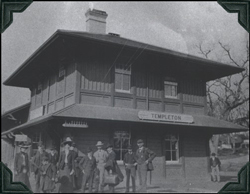 Templeton had its turn as the last town on the railroad line from San Francisco. For a time it was the terminus as the Southern Pacific Railroad built its line southward. 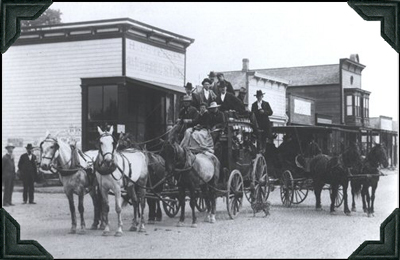 Horse-drawn stagecoaches met the trains and transported passengers to San Luis Obispo where they connected with stages for the south. Templeton remained the end of the line until 1889 when the rail lines were extended 14 miles south to Santa Margarita. In just a few months the town ". . . contained one extensive and two smaller (but quite respectable) hotels, three general merchandise stores, a well-stocked drug store, a well-supplied meat market, a shoe shop, two blacksmith shops, five saloons, a billiard saloon, a large lumber yard, a sash and blind shop, several building and painting establishments, two barber shops, a public hall, a post office with daily mail service and 25 to 30 dwelling houses." The first home in Templeton, built by Chauncey Hatch Phillips of the West Coast Land Company, was located at the north end of Main Street. Today that house is the Country House Inn, a beautiful bed and breakfast. Albert Crum built the first store building at the corner of Sixth and Main streets. The original building had two stories. The upper story was used for a hall until 1888 when it was converted to living quarters for Mr. Crum and his wife. When Mrs. Crum complained that the structure was too drafty and cold, Mr. Crum took the upper story and moved it to a lot near the corner of Sixth and Crocker streets, where it still stands. After the business was sold, the lower half of the building was moved one block north and is now Mc-Phee's Grill. 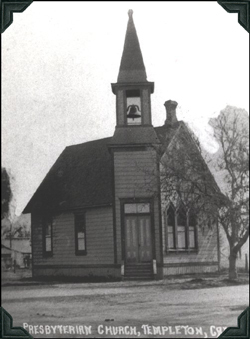 Thus, the first building in Templeton still exists although in two different locations. By the 1890s, Templeton also had a bank, which was established by Adolph Horstman. Other members of the banking firm were Hartwig Wessell, who became president, and Andrew Seeman. Most of the stock was locally owned. The bank, housed in a brick building with a 100-foot frontage, was located on the east side of Main Street between Fifth and Sixth streets. The railroad buildings consisted of a handsome depot and freight warehouse, a turntable and roundhouse and other appointments of a first-class station that provided telegraphic and express facilities. The West Coast Land Company built an office building, which still stands today. It is located between the museum and the Templeton Building, and it houses a beauty salon. In 1898 a fire started in a saloon, spread to the Hans Petersen store (now Hewitt Hardware) and north to the very end of the block, destroying a large section of the downtown. The pioneer spirit prevailed and soon new buildings were erected, brick buildings replacing the original wooden buildings. The continued southward construction of the railroad, along with the interest in Paso Robles' mineral springs and mud baths, caused the early growth of Templeton to wane. However, for many years it was the natural outlet from both east and west for grain, wood, charcoal, grapes, apples, prunes and other fruit. 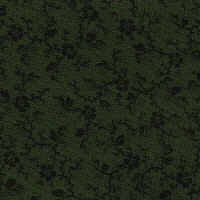 Crews were sent here every summer to make boxes at the railroad yards for use in packing fruit from nearby ranches. Because shipping by train was the only way of transporting cattle to market in early days, Templeton's corrals were crowded during the shipping season. Herds were driven in from as far away as the coast and the Kern County line. During Templeton's boom days, the West Coast Land Company owned and controlled a newspaper called the Templeton Times. Later there were two papers: the Templeton Advance and the Times. The spiritual needs of the small community were met by two churches. The first church was the First Presbyterian Church, chartered on May 5, 1887. The original building, located on the corner of Sixth and Crocker streets, was dedicated on Nov. 11, 1888. 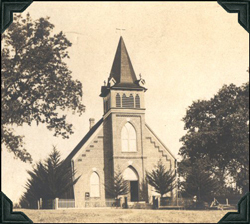 The Bethel Lutheran Church congregation was organized in 1887, and they completed their building at the corner of Third and Crocker streets in the late fall of 1891. The structure was made of bricks manufactured locally. For many years, services were conducted in Swedish. As the population of the little settlement increased, a school was needed to educate the children. 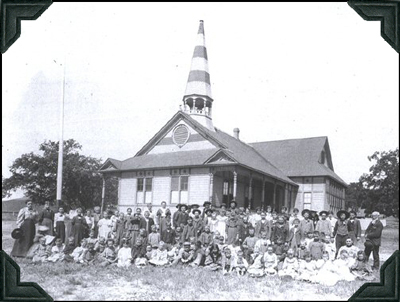 In 1887, the Templeton school district was created out of territory that had been part of the Paso Robles school district. A three-room, three-teacher schoolhouse, built on a block of land donated by the West Coast Land Company, was used until 1923 when another structure, still in use, was completed. Templeton High School classes began in 1916, and the first graduating class, with eight graduates, was in 1920. Referencing Templeton, Annie L. Morrison in her 1917 book, San Luis Obispo County and Environs, written in conjunction with John H. Hayden, stated, "Nowhere on earth is there a more beautiful spot, with the distant blue mountains; the rounded hills covered in spring with wild oats, where not cultivated; the wide, park-like valley dotted with immense oaks; the Salinas river, with its tree-fringed banks—alders, willows, sycamores and oaks—and spicewood breathing its fragrance on the air. . . . Templeton is now coming into its own."